my last post a couple days ago seems to have vanished so i have lost days when i should have been dosing. i am very depressed as due to illnesses i am unable to follow the chart for dogs in recovery book as i get headaches from anything technical with numbers. my dog is 25llb and i cant work out how to dose him. he is going downhill fast and i am at a loss how to help him. he has lymphoma bcell, any help please needs to be laid out like instructions to follow as i do not retain info for long. i understand that as per book weight has to be taken into account with dog but am panicking as i dont know how to do this. i dont understand the collumns which is very frustrating as its only since stroke heartattacks i been like this. Jeffers, I answered your questions yesterday, but because the forum software was being updated, my post is gone! So, I will try one more time. 1. Make up an 8 drop dose of MMS1 and add it to 4 fl oz (120 ml) of water. This is called CUP 2 in the book. Keep CUP 2 in a closed bottle so CLO2 won't escape. Store it in a fridge to keep it cold and away from light. 2. You will be taking out 8 doses every day from CUP 2 to give to your 25# dog hourly, for 8 hours each day. 3. The Starting Procedure Protocol lasts for 4 days, then you move up to Protocol 1000. 4. On day 1 of the Starting Procedure take out 13 drops from CUP 2 and add to some water. Squirt this diluted MMS1 dose down your dogs throat using a syringe, so he gets all of the dose. Do this hourly for 8 hours. Putting the dose in his water dish won't work. You do not need a needle for the syringe. 5. On days 2 and 3 of the Starting Procedure take out 26 drops from CUP 2 and add to some water. Squirt this diluted MMS1 dose down your dogs throat using a syringe, so he gets all of the dose. Do this hourly for 8 hours. 6. On day 4 of the Starting Procedure take out 38 drops from CUP 2 and add to some water. Squirt this diluted MMS1 dose down your dogs throat using a syringe so he gets all of the dose. Do this hourly for 8 hours. 7. You will need to make a fresh CUP 2 each day because it won't last longer than one day. 8. On day 5, begin Protocol 1000. Let me know before you start and I will get the information from the book for you. thank you so much thats where my posts must have gone then. i really appreciate the help and the instructions i can print out. my dog is now very poorly and refusing food and drink but i did manage to get some in him as he wouldnt swallow it. i have been up all night with him and am suffering from severe chest probs due to flu so we are both in a right state. thanx for your help CLO2 i will finish the starting procedure tmorrow sunday. he has picked up a bit and is now eating small amounts. i have looked at the book again but cant fathom it out so will appreciate your help with p 1000. I will read the book on P1000 tomorrow and post here the steps you will need to follow. Jeffers, the following is how to use Protocol 1000 with your 25# dog. 1. Make up an 8 drop dose of MMS1 and add it to 4 fl oz (120 ml) of water. This is called CUP 2 in the book. Keep CUP 2 in a closed bottle so CLO2 won't escape. Store it in a fridge to keep it cold and away from light. 2. You will be taking out 8 doses every day from CUP 2 to give to your 25# dog, hourly, for 8 hours each day. 3. On day 1 of Protocol 1000 take out 2 milliliters from CUP 2 and add to some water. Squirt this diluted MMS1 dose down your dogs throat using a syringe, so he gets all of the dose. Do this hourly for 8 hours. Putting the dose in his water dish won't work. You do not need a needle for the syringe. 4. If your dog has any discomfort with this 2 ml dosage, reduce to 1 ml and continue hourly dosing. 5. If your dog has no discomfort with this 2 ml dosage, continue hourly dosing. 6. On day 2 of Protocol 1000 continue with 2 ml per hour MMS1 dosing as on day 1. 7. 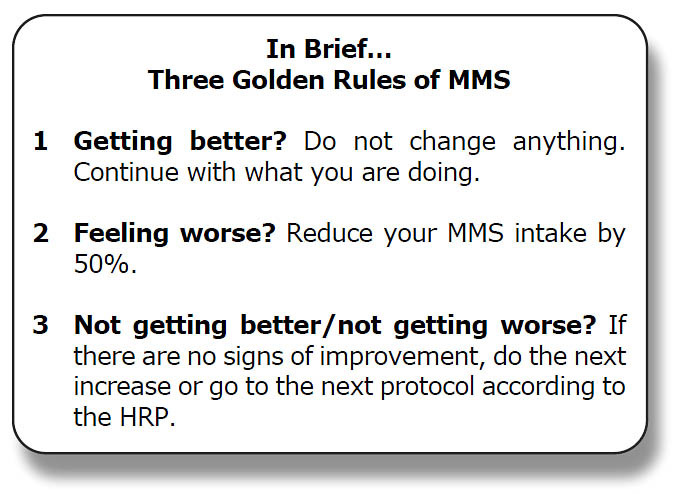 On day 3 of Protocol 1000, If no problems with 2 ml per hour MMS1 dosing, increase hourly dosing to 3.5 ml of MMS1. 8. On day 4 of Protocol 1000 continue with 3.5 ml per hour MMS1 dosing as on day 3. 9. On day 5 of Protocol 1000, If no problems with 3.5 ml per hour MMS1 dosing, increase hourly dosing to 4.5 ml of MMS1. 10. On day 6 of Protocol 1000 continue with 4.5 ml per hour MMS1 dosing as on day 5. 11. If there is no improvement in your dogs health at day 6, add DMSO to each hourly dose. If you need to do this, let me know and I will provide instructions. 12. You will need to make a fresh CUP 2 each day because it won't last longer than one day. many thanx for your help. i wouldnt have been able to do this without your help. Jeffers, Golden Rule #1 would apply for your dog at this time. Right?